America’s Best Coins of 2018 – Struck as Silver Proofs All in One Set! Each year, the United States Mint’s Proof and Uncirculated coin sets make their way to hundreds of thousands of collectors. Released soon after those two sets make their debut is the annual Silver Proof Set. Now, the Mint has just released its Limited Edition Silver Proof Set that includes silver and only silver coins. What’s more, it also features the inclusion of the collector version of this year’s 2018 Silver Eagle – which was not available in any of the earlier sets! The 2018 United States Mint Limited Edition Silver Proof Set™ is without a doubt one of the most impressive silver proof sets in the world. It contains eight coins expertly crafted in 90% fine silver with stunning proof finishes struck by the famous San Francisco Mint. 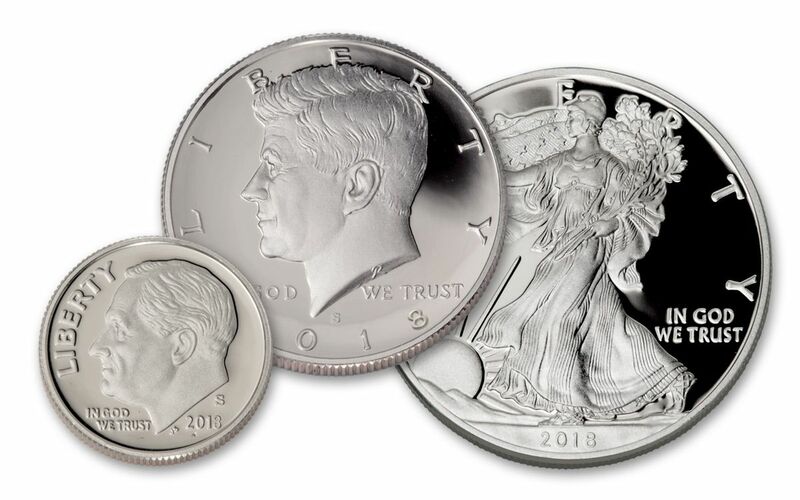 For fans of American coinage this silver proof set is the peak of gleaming perfection! 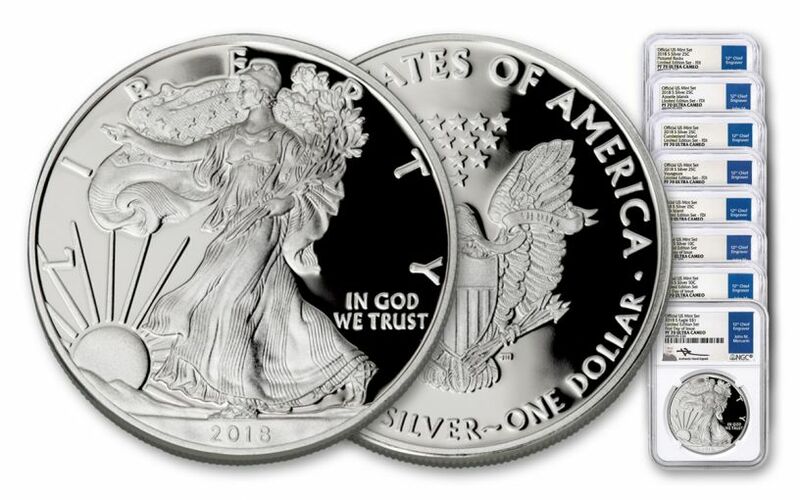 2018 American Eagle One-Ounce Silver Proof with the “S” mint mark. 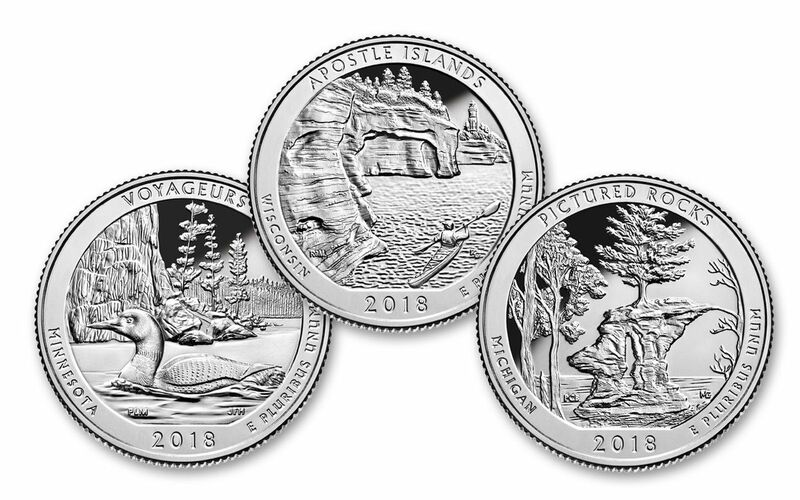 All five America the Beautiful Quarters® from 2018 – Michigan's Pictured Rocks National Lakeshore, Wisconsin’s Apostle Islands National Lakeshore, Minnesota's Voyageurs National Park, Georgia’s Cumberland Island National Seashore, and Rhode Island’s Block Island National Wildlife Refuge. In addition, since each set is struck in proof condition at the San Francisco Mint using specially polished dies and selected planchets, all of your proofs will feature the "S" mintmark. 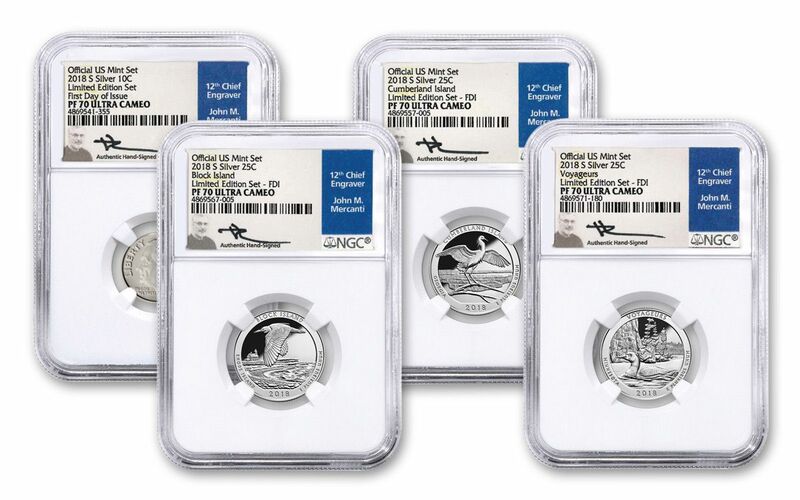 As a further testament to their quality and beauty, each has been certified by the Numismatic Guaranty Corporation (NGC) as being perfect Proof-70 Ultra Cameo (PF70UC) condition, a distinction that means your perfectly-graded proofs will have ZERO imperfections – showing all features and fields exactly as the engraver and mint intended! In addition, your proofs will also be certified as First Day of Issue (FDI) coins by NGC, meaning they were received by NGC or an NGC-approved depository by the release date or on the business day within 24 hours of the official release date. Plus, each proof comes sonically sealed in an acrylic holder with a special label featuring the personal signature of John Mercanti, the U.S. Mint’s 12th Chief Engraver! These silver coins represent the best America has to offer. Add one set or several to your cart today! EIGHT INSPIRING DESIGNS IN ONE SET – From Adolph A. Weinman’s design of Walking Liberty on the Silver Eagle to John R. Sinnock’s portrait of President Franklin Roosevelt on the dime to the impressive set of America the Beautiful Quarters, this set features some of the most reverent and beautiful designs ever created in the history of American coins. STRUCK IN GLEAMING SILVER – Each coin in this spectacular eight-piece set was struck in 90% silver by the San Francisco Mint – that amounts to 2.34 ounces of gleaming fine silver! 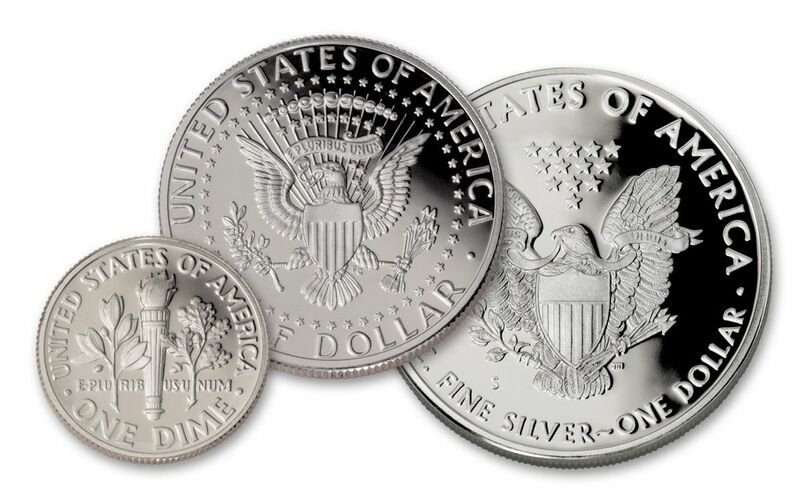 LEGAL-TENDER AMERICAN COINS – Even though you would never see an American Silver Eagle $1 coin in circulation and rarely come across a Kennedy Half Dollar, each of these coins are all legal tender in the United States. GRADED IN PERFECT PROOF CONDITION – Each coin in your 2018 United States Mint Limited Edition Silver Proof Set™ was graded by the Numismatic Guaranty Corporation (NGC) as being in perfect Proof-70 Ultra Cameo (PF70UC) condition! KEY FIRST DAY OF ISSUE CERTIFICATION – Your proofs will also be certified as First Day of Issue (FDI) coins by NGC, meaning they were received by NGC or an NGC-approved depository by the release date or on the business day within 24 hours of the official release date. 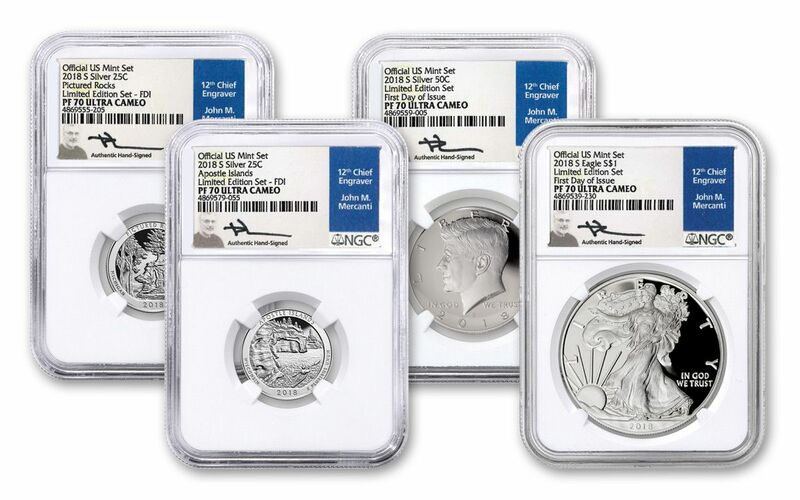 PERSONALLY SIGNED BY A LEGEND IN THE COIN WORLD – Each proof comes sonically sealed in an acrylic holder with a special label featuring the signature of John Mercanti, the U.S. Mint’s 12th Chief Engraver! LIMITED AVAILABILITY – The U.S. Mint has released just 50,000 of these sets – and only 300 have been certified as Proof-70 Ultra Cameo First Day of Issues with Mercanti hand-signed labels! All silver all the time; secure the United States Mint Limited Edition 2018 Silver Proof Set. 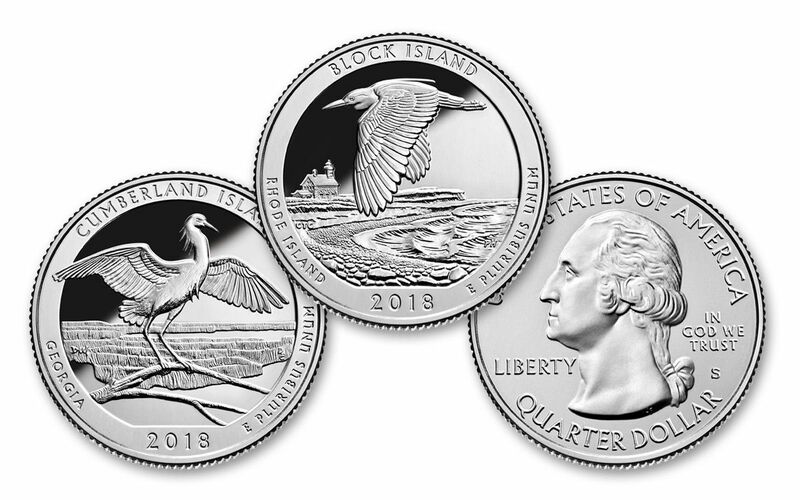 Get all five 2018 quarters, the half-dollar, dime AND this year’s Siler Eagle with the “S” mint mark – all in flawless First Day of Issue condition! Order yours now!